Jamie Herman created this piece called “Tilt” while he was a student at the Vermont Woodworking School. It won the Grand Prize in the 14th Annual Veneer Tech Craftsman’s Challenge. 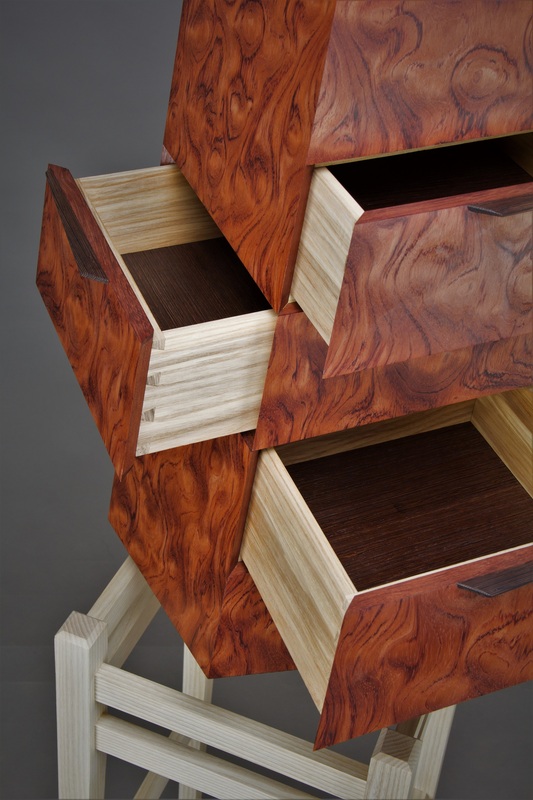 An angled chest of drawers on a stand created by a student at the Vermont Woodworking School won grand prize in the 14th Annual Veneer Tech Craftsman’s Challenge. As announced at the IWF Atlanta trade show on July 23, 2018, Herman was awarded the $3,000 top prize in this design competition that recognizes excellence in veneer woodworking. Certainly Wood, the distributor that supplied the materials, was awarded $2,000, and sales representative Greg Engle was awarded $1,000, in recognition of their roles in the supply chain. Top prize in the competition was just the beginning of the superlative veneer work honored. Six additional entrants each won $1,000 in categories covering architectural woodworking, cabinetry, furniture, marquetry, specialty items, and student work. Here is more about each of the category winners. Archtectural woodworking: Andrei Zborovski of Avrora, Inc., Palm Coast, Florida, won for his entry, “Powder Room.” Judges said, “The selection and unique spin matching of the veneer compliments the other materials used in this unique WOW bathroom.” The 6x6x10-foot bathroom uses Santos rosewood, and wenge veneers as well as Java and Madagascar Lumicor. Cabinetry: Matthew Chase Woodworks of Petaluma, California, won for his “Royal Ebony TV Cabinet.” Judges said, “Ebony TV Cabinet is a functional work of art maximizing grain patterns which creates unique imagery using a rare white ebony veneer.” Chase said the piece was designed to stand alone as art whileconcealing a television behind two synchronized vertical sliding doors. “We wanted the wood itself to be the star,” he said. Furniture: Michael McDunn of Greenville, South Carolina won for his “Dining Table with Basket Weave Inlay and Lotus Base.” Judges said, “The use of fine parquetry and structural curved lamination is a perfect blend of exotic veneers.” The piece features sand-shaded satinwood veneer for the basket weave, and quartersawn sapele over poplar bent laminations for the legs, which are also tipped with solid ebony. Marquetry: Shaun Fleming of Wooden Touches LLC, Haiku, Hawaii, won for “Just the Essentials.” The marquetry on the cabinet and hidden functional hinges trick the viewer to reach for the wrong side when opening the door. Judges said, “The playfulness within the trompe-l’oeil fools the eye creating a sense of wonder.” Veneer used included wenge, koa, maple, milo, anigre, European beech, mahogany, and poplar. Paul Schurch of Santa Barbara, California, won in the Specialty Items category for his “Koa Dress.” The fully functional dress is made with koa micro veneer just .02mm thick and weighs just 1.5 pounds. Andrei Zborvoski of Avrora Inc., won the new category of First Time Entrant for “Japanese Sparrow on Bamboo,” a 60 x 32-inch wall art piece in figured ice birch, poplar, American walnut, English brown oak, and amboyna. Acknowledging that the winners roster over the years has included prominent companies and well-known designers, some of whom are multiple award recipients, yet wanting to encourage participation by those who have not previously entered, regardless of the size of the project or the amount of material used, Veneer Technologies this year offered a special $1,000 award for First Time Entrant. Andrei Zborvoski of Avrora, Inc., won the new category for “Japanese Sparrow on Bamboo,” a 60 x 32-inch wall art piece in figured ice birch, poplar, American walnut, English brown oak, and amboyna. “The execution and attention to detail was astounding in this first-time entrant,” judges commented. Zborvoski also won the category award for Architectural Woodworking and an honorable mention prize for Cabinetry, making him a three-prize winner in his first entry in the Craftsman’s Challenge. Experts from the fields of woodworking media, education, and manufacturing composed the panel of judges. For 2018 they were Michaelle Bradford, editor of Closets & Organized Storage magazine under the Woodworking Network brand; Thomas Brooks, global commodities manager for Masonite International; and third-generation artist/designer Scott Grove, author and featured instructor at the Marc Adams School of Woodworking and the Chippendale International School of Furniture in Scotland. 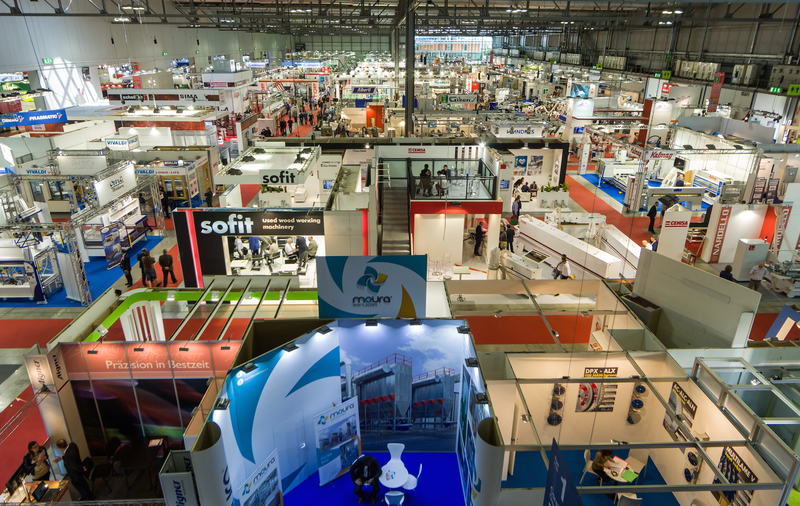 All entries in this year’s competition, co-sponsored by FDMC magazine, can be viewed on the Veneer Technologies website, www.veneertech.com. Details about the grand prize and category winning entries plus judges’ comments thereon also can be found at the website. The site features archives of all entries from 2005-2018. Veneer Technologies, located in Newport, North Carolina, is one of the industry’s largest manufacturers of high quality face veneer, sheet veneer, and edgebanding. Veneer Tech sources wood species worldwide.